Background: When last we met teenaged girl-genius Ashley Calhoun, she sent her best friend Louise “Lou” Greenspan back in time to break up her 16 year old mother’s romance with a no-good hippie, watch The Who at Woodstock for like 30 seconds and learn a valuable lesson about how people are pretty much jerks all over. At least she was able to help deliver the Woodstock Baby, who would grow up to become her boyfriend, and steal her teenaged mother’s poetry, which would shame her 1980s mother into quitting her corporate yuppie law firm and save a public meadow from the clutches of an evil power company. But now Lou faces a new crisis which will also necessitate traveling back in time for some reason! I skipped ahead a few volumes, which look to involve Ashley sending her friends back in time to Western Times, Classic Hollywood Times, Witchcraft Times, Pirate Times and Medieval Times (the Times, not the dinner show). I guess Ashley made a few upgrades on the time machine in the interim, because they can now travel through time and space, so Lou and her big blue sweater get to go somewhere besides Suburban Connecticut Times. The Plot: As we learned in Swept Away #2: Woodstock Magic, Lou has a very narrow focus of interests: “If it wasn’t from the sixties, she didn’t want to hear about it.” But lately Lou has been listening to 1950s rock music as well, courtesy of her Tommy Chong-like Uncle Joe, who for the sake of convenience, I’m just going to refer to as Uncle Spaceman. Ashley is incensed when her American History teacher makes the 1950s out to be totally boor-ring. But Lou knew differently. She’d seen James Dean in Rebel Without a Cause and Marlon Brandon in The Wild Ones [SIC]. And Elvis Presley- the star of her next trip to the past- in Jailhouse Rock. In these versions of the fifties, kids wore leather jackets, drove souped-up cars with tail fins and danced the night away to a wild new kind of music called rock ‘n’roll. Far-out, Lou thought to herself. And why does Lou have to travel to the 1950s and meet Elvis? Because she gets a double-whammy of bad news after school: her boyfriend Ethan is moving to California and Uncle Spaceman’s landlord is going to sell the building that his record store and apartment is located in to a chain of video stores. But! Lou can solve both of these problems by traveling back in time to prove that the guitar Uncle Spaceman bought for $20 at a rummage sale belonged to Elvis so he can auction it off to buy the building himself, and then Ethan can move in with him, because his parents will totally believe that those pipes are For Tobacco Purposes Only. Even Ashley is skeptical: “But are you sure going back to the fifties is the answer?” Geez, Ashley! After seven books you should know that traveling back in time is ALWAYS the answer! Back in 1969 no one would dream about talking about material possessions the way these kids do. The Woodstock Generation was more interested in sharing and living off the land. As usual, Stacy and her mother have no problem with harboring a teenage runaway, so Lou goes to live with her new friend for a few days, where she discovers the guitar that Uncle Spaceman bought in Stacy’s closet. How… convenient. Stacy explains that she only borrowed it from Elvis when she went backstage, so she could embroider him a guitar strap. She just hasn’t found the right moment to return it… yeah, the right moment. This screws up Lou’s plan to take a picture of Elvis with the guitar and keep HER ENTIRE LIFE from being ruined. Luckily, a solution presents itself the next day, when Lou attends school with Stacy. In between making up more elaborate lies about how her uncle is a spy for the CIA who also works at the City Lights bookstore to cover for being from the future, Lou learns that Stacy’s beatnik kinda-boyfriend, Virgil, works at the amusement park that Elvis and his entourage bought out for the very next day! Now they can sneak in, give Elvis the guitar back and take his picture with it. Lou and Stacy are successful in sneaking into the park, but some wacky hijinks with the Memphis Mafia ensue before Elvis can get everything straightened out and Lou gets her picture and Stacy gets to sing Elvis the song she wrote for him. Elvis is so impressed that he gives her the guitar. Unfortunately, at that moment Ashley’s time machine breaks and Lou gets zapped back to the present, accidentally leaving her camera in 1956. NOW WHAT WILL HAPPEN??? …although it does not solve his actual problem. Luckily, he apparently bought a box of teenage girl-trash with the guitar, including Stacy’s old math test and high school yearbook. Which contains the picture Lou took of Elvis with the guitar. Off to Christie’s to auction it off! Where middle-aged Stacy and Virgil buy it. Stacy is still wearing her Elvis Fan Club dress, which is not at all creepy. So, happy endings for all, except Ashley, who is now stuck with a busted time machine. Since this is the last book in the series, I assume she never got it fixed. Also Lou is obsessed with the idea that if Ethan moves to California he’s going to dump her for Cybil Shepherd. 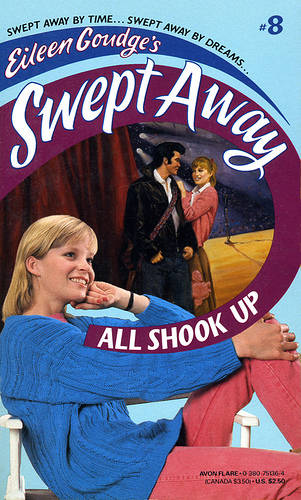 This entry was posted in Vintage YA Fiction and tagged 1987, Author G, Avon Flare, Girls Series, Romance, Swept Away, Time Travel, Title A. Bookmark the permalink.